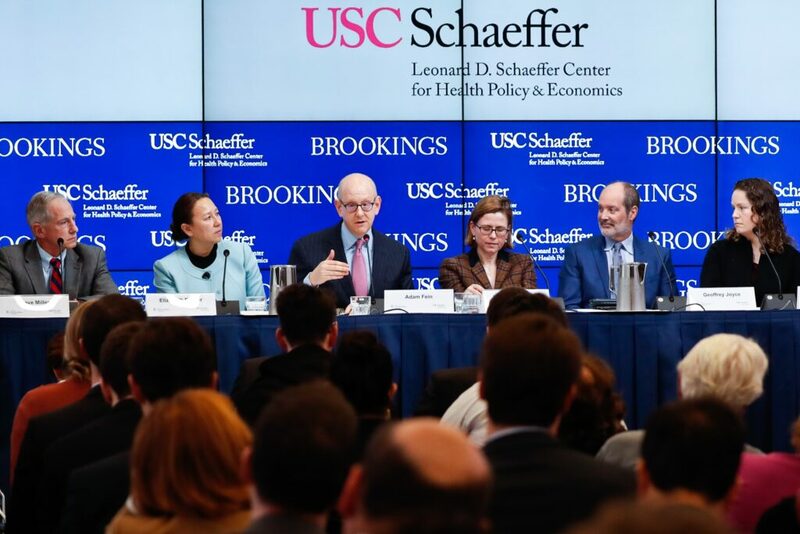 The USC-Brookings Schaeffer Initiative for Health Policy combines the policy and analytic expertise of Brookings with the data and analytic strengths of the Schaeffer Center to produce evidence-based policy recommendations on salient health policy issues. The USC-Brookings Schaeffer Initiative for Health Policy is committed to developing innovative policy solutions to our nation’s most pressing healthcare challenges. To achieve its mission, the USC-Brookings Schaeffer Initiative analyzes and develops policies to address key problems in healthcare. The Initiative draws on the policy and analytic expertise of the Center for Health Policy at Brookings and the data and analytic strengths of the USC Schaeffer Center. Since its launch in 2016, the Schaeffer Initiative has solidified its position as a leader in rigorous and insightful health policy research and analysis. In 2017, Initiative experts were called upon by Congressional members and their staff, White House staff and several state policymakers for insights on the nation’s most pressing health policy challenges. Paul Ginsburg, the Leonard D. Schaeffer Chair at the Center for Health Policy at Brookings and director of public policy at the USC Schaeffer Center, leads the Initiative, working closely with Loren Adler, Initiative associate director, and Dana Goldman, director of the USC Schaeffer Center. Assessing and improving the Affordable Care Act (ACA) and Future Health Care Reform. The ACA is one of the most far-reaching and complex pieces of healthcare legislation in recent decades. Despite news coverage, its widespread effects are still not fully understood. The Initiative provides objective analysis of reform proposals and guidance on improving the functioning of the individual and small-group markets. Charting the Course of Medicare Medicare reform is vital to the endurance and efficacy of the program. The Congressional Budget Office projects that – without policy intervention – Medicare will account for 23 percent of all federal noninterest spending and 5 percent of GDP by 2035. Moreover, a significant share of Medicare beneficiaries today live with one or more chronic conditions. Medicare reforms must better meet the needs of today’s beneficiaries while ensuring the program is financially stable in the future. Maximizing the Value of Innovation in Drugs and Devices Prescription drugs are an increasing slice of healthcare spending for state and federal governments, insurance companies and consumers. Investigating novel drug and device reimbursement models that better align with incentives with patients, payers and providers has the potential to control costs and improve patient outcomes. See the latest research and policy analysis from the Schaeffer Initiative. Download the Schaeffer Initiative 2 Year Report here.